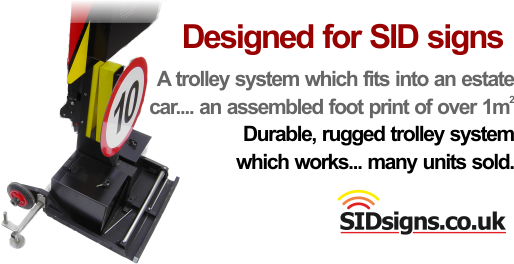 ﻿ Speed sign trolleys, the ultimate in portable SID convenience. A simple, lightweight, Black powder coated aluminium tripod fitted with specially designed stabilising feet. That's about all there is to it. The most important part of this sign tripod are the feet. Manufactured from welded aluminium plate these feet pivot independently allowing for take up on uneven ground. Applied to the underside are thick rubber pads which reduce slippage and give a certain amount of grip even on smooth surfaces. 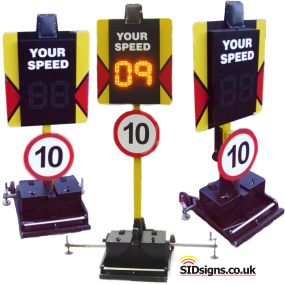 Do you need a sid system suitable for temporary speed watch work? Lightweight, easy to use, quick to assemble, simple to transport and store. 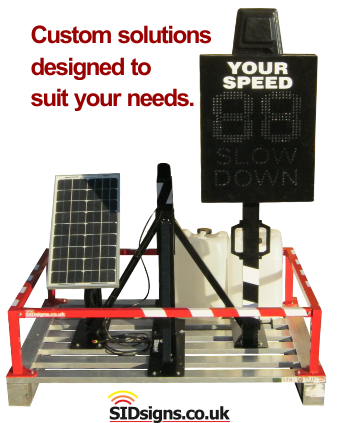 Tripod systems are perfect for this kind of speed sign work allowing you to carry out traffic management in problem areas with the minimum of fuss. The best news? The price, contact us to find out more.